Many states offer reciprocal privileges for contractor’s licenses issued by another state. Generally reciprocity is only available for equivalent licenses with the same classifications. It is a common misconception that a reciprocity agreement between states allows contractors to avoid licensing requirements in that state. Contractors must still go through the process of obtaining a license in each state that they plan to operate. Reciprocal agreements typically waive the trade portion of the examination required for a state contractor license. 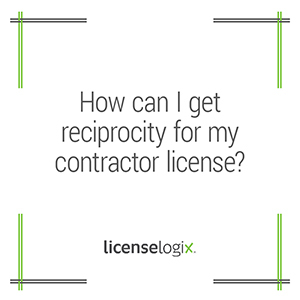 To meet the reciprocity requirements a contractor must be licensed, having passed the equivalent trade exam, and be in good standing in the reciprocal state. A license application must still be submitted and the business law exam must still be passed by the applicant in each state they want to work as a contractor. Sometimes a contractor must have held a license for a specific period of time before they can take advantage of reciprocal agreements. For example, Arizona requires that the applicant is actively licensed and in good standing for five (5) consecutive years in the reciprocal state before they can apply by reciprocity. In Nevada, the applicant is required to be actively licensed and in good standing in the reciprocal state for five (5) of the last seven (7) years. In Arkansas, the applicant may also have to get a form signed by the state they are currently licensed in verifying that they meet the requirements of reciprocity. LicenseLogix will help guide contractors through the entire licensing process, whether they are seeking a license through reciprocity or managing ongoing renewals. We can help you obtain all of the licenses and registrations you need, minimizing time-consuming and costly delays. For additional help you can fill in the form on the bottom or give us a call at (800) 292-0909.